hile the Wright brothers may have been the first to make a sustained, controlled flight, they were just two among hundreds of brave men and women who helped to give the world its wings during the earliest days of aviation. Their Flyer was but one of many historically important aircraft. Below are brief descriptions and photos of some of the most important people and planes, and where available resources and links where you can find more information. In some cases, contributors have supplied expanded histories and biographies. Those are listed at the right and linked below. 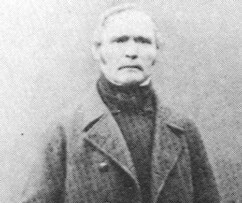 Jean-Marie Le Bris, a French sea captain, built several bird-like gliders designed to be launched from a moving cart. He flew the first of these in 1857 on a beach at Sainte-Anne-la-Palud in France. According to witnesses, his first flight covered about 650 feet (200 meters). On his second flight, he broke his leg. With the assistance of the French Navy, he built another glider with improved controls -- he could vary the angle of the wings and the tail. Le Bris made several attempts to fly it in 1868, both manned and unmanned, but with no great success. 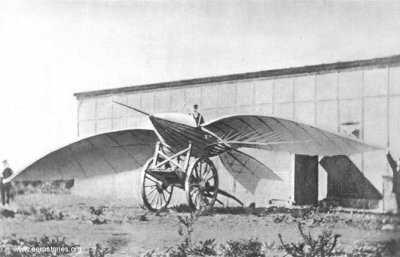 Le Bris' second glider, built in 1868. It was about the same size but somewhat lighter than the first. 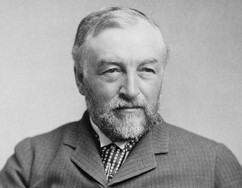 Samuel Langley, born 1834 in Massachusetts, was trained as an architect and engineer, but distinguished himself as a mathematician and astronomer. He became America's most influential scientist after he helped establish international standardized time zones, greatly simplifying travel by rail. 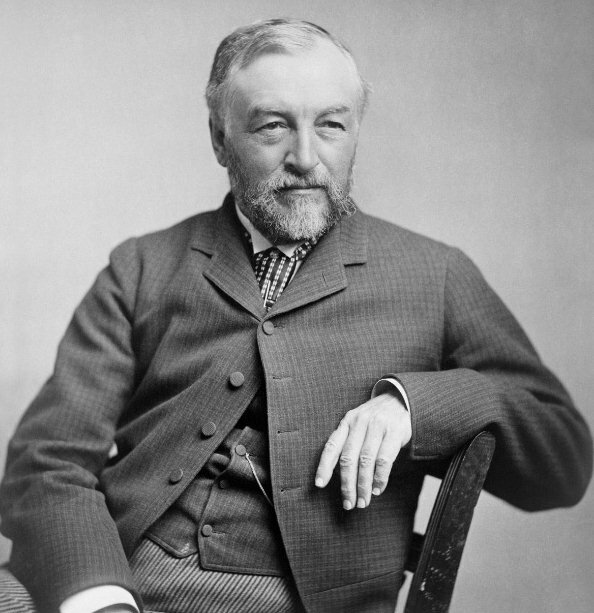 When he became the Secretary of the Smithsonian Institution in Washington, DC in 1887, he found himself with the time and resources to pursue another passion -- aviation. He had begun his own aeronautical experiments while director of the Allegheny Observatory, where he had built a huge whirling arm. (Technically, his position was Professor of Astronomy and Physics at the Western University of Pennsylvania, which owned the observatory, but he never taught classes.) He studied wing shapes on this machine and tested them in flight on models. 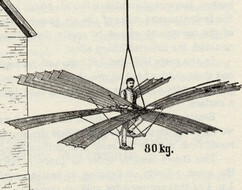 He built an even larger whirling arm and continued his tests at the Smithsonian. He also established the Langley Aeronautical Laboratory with a full-time staff. (This was a forerunner to the National Advisory Council on Aeronautics or NACA, the precursor to NASA.) He even invented a word to describe his research, "aerodromics," taken from the Greek aerodromoi or air runner. He began to build large steam-powered, unmanned flying machines or "aerodromes" in 1892. Starting with No. 0, the first 6 (0 through 5) were failures. In 1895, he rebuilt No. 5 and completely revised No. 4, christening it No. 6. Both had 1 horsepower steam engines. In 1896, he stunned the world by launching Aerodrome No. 5 from a houseboat and flying it about 3,300 feet (1005 meters) over the Potomac River. Six months later, he bested his own record by flying the No. 6 almost 4000 feet (1219 meters). In 1898, the War Department gave Langley $50,000 to develop his aerodrome design into a man-carrying machine. It was originally to have flown in 1901, but Aerodrome A, as it was called, was delayed. Instead, Langley's team produced a quarter-size model of Aerodrome A powered by a 3.2 horsepower gasoline engine. Although it was launched several times in 1901, it failed to fly properly. Langley finally got it into the air in August of 1903, making it the first gasoline-powered aircraft to fly. Aerodrome A was completed a few months later and launched on 7 October 1903. It did not fly, but it simply slid into the Potomac River. Claiming that the airplane had caught on the launching mechanism, Langley's team rebuilt it and tried again on December 8 with the same result. Later studies would show that in both cases, the flimsy wings of Aerodrome A had twisted or broken, letting the aircraft fall into the water. Langley was viciously ridiculed both in Congress and in the press, and the War Department withdrew its support for his research. Langley insisted that the Aerodrome could have flown; that the fault lay in the catapult, but is was never tested again in his lifetime. He died in 1906. For an expanded history of Langley's Aerodrome A and its test flights, see The Wright/Smithsonian Controversy. Aerodrome No.5 assembled in the Langley Aeronautical Laboratory at the Smithsonian. Stephen Balzer and Charles Manly developed an engine for Aerodrome A that weighed less then 200 pounds and developed up to 52 horsepower. Aerodrome A perched on its launch catapult, which was itself mounted atop a house boat. This photo was snapped just as the Aerodrome left the launcher. You can see the front wing twisting so the back edges are angled up. This forced the aircraft to pitch down toward the water. One of Langley's rubber band-propelled model "aerodromes." The successful launch of Aerodrome No. 5 on the Potomac River on 6 May 1896. Charles Manly (left), the pilot of Aerodrome A, with Langley (right). Manly had optimistically sewn a barometer in the knee of his pants to tell how high he was flying. The launch of Aerodrome A on 7 October 1903 – the aircraft "slid into the Potomac like a handful of wet mortar," as one journalist reported it. During the December launch attempt, the rear wings collapsed just as the Aerodrome left the catapult. The rear of the aircraft dropped and the aircraft flipped over almost on its back. As it crashed into the water, it pinned its pilot, Charles Manly, beneath it. Fortunately he was able to escape by diving down and away from the airplane. 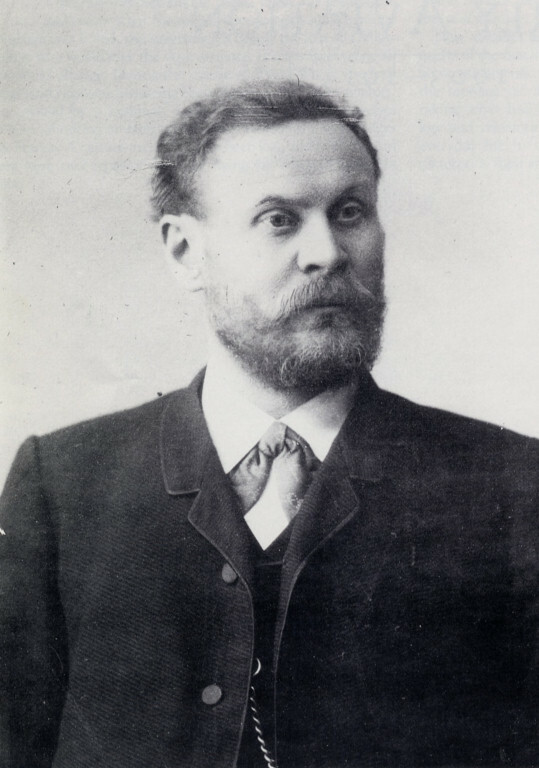 Otto Lilienthal of Germany was the first successful pilot -- the first man to actually launch himself into the air and fly – not just one or two times, but over and over. 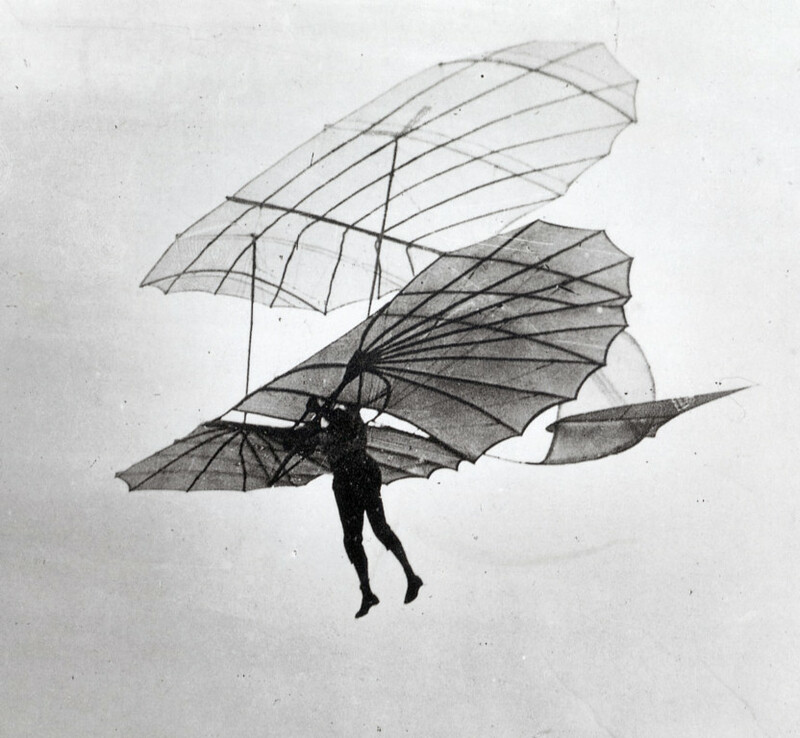 Between 1890 and 1896, he made over two thousand successful glider flights and tested over a dozen glider designs. 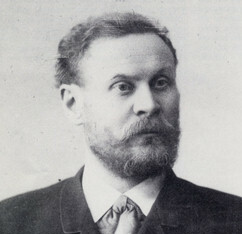 Born in 1848 in Pomerania, he trained as an engineer in Potsdam and Berlin. 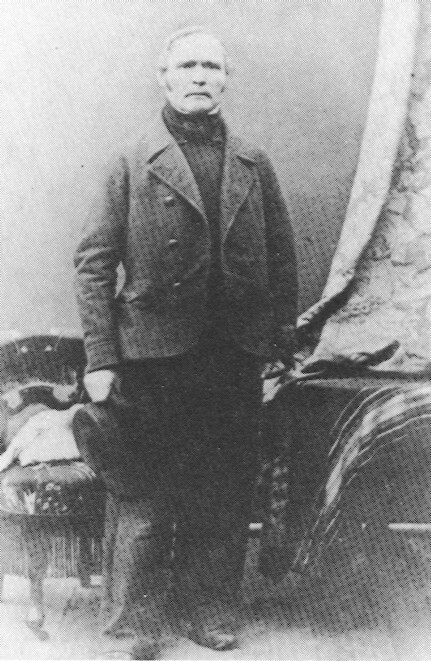 He and his brother Gustav had been interested in aviation since the time they were young. 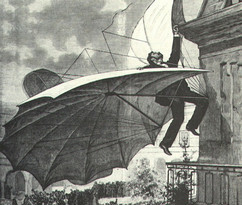 They had even built a six-wing ornithopter (flapping-wing flying machine) and tested it against a counterweight in 1869. For much of his life, he seemed convince that while man might learn to fly in fixed-wing gliders, he would ultimately achieve powered flight in ornithopters. He conducted whirling-arm experiments to gather data on the lift and drag of various wing shapes, then published his research in 1889 in Bird Flight as the Basis for Aviation, one of the classic of aeronautical literature. 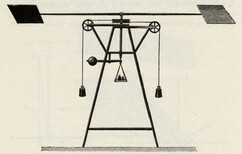 The lift and drag tables in the book were circulated widely. 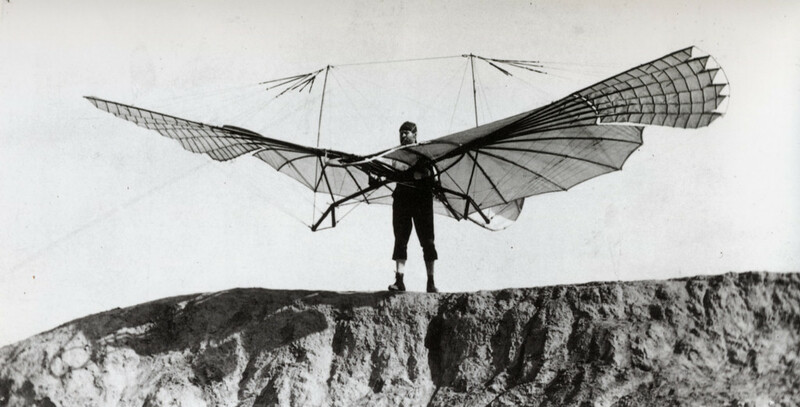 In 1890, he built a glider that resembled a tailless bird. It was a hang glider, designed to be flown with the pilot hanging beneath and balanced by the pilot kicking his legs this way and that to shift his body weight. Simply called No. 1, it was not successful. Nor was the No. 2, which probably had a tail. 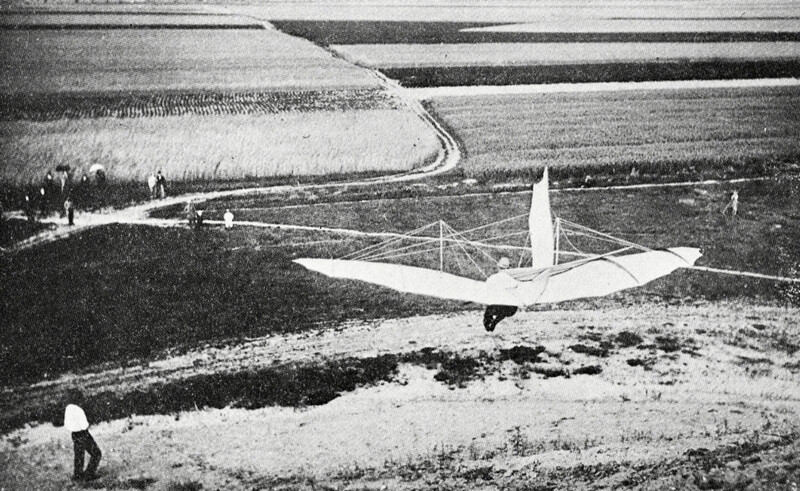 Lilienthal finally got off the ground in 1891 with the No. 3. In 1893, he built and flew the No. 6, catching the world's attention with his apparent mastery of the air. The No. 6 had folding wings and could be rigged with different cambers to test different wing shapes. Also in this year, Lilienthal built the first of two powered machines, the No. 16. It was tested as a glider, but was never flown with it's carbolic acid motor in operation. 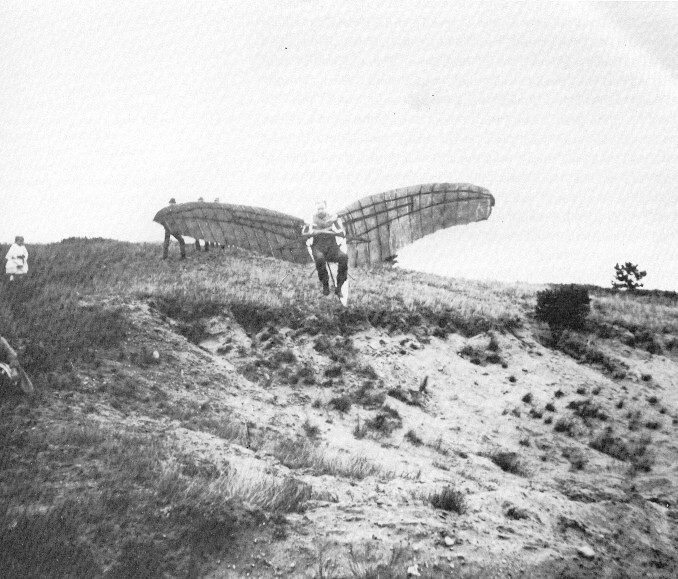 In 1894, Lilienthal built an artificial hill near Lichterfelde, 50 feet (15 meters) tall with a storage shed on top for his glider. During the same year, he built and tested glider No. 9, which was outfitted with a "rebound bow" on the front to absorb the impact of a crash. This was fortunate, because it was in this glider that Lilienthal suffered his most serious crash until the one that killed him. A stall followed by a nose-dive buried the rebound box in the ground, but the device worked, saving Lilienthal's life. Later that year, Lilienthal built the No. 11, his most successful and trusted glider. He called it his "Standard Sailing Machine," and sold at least 8 copies of it. 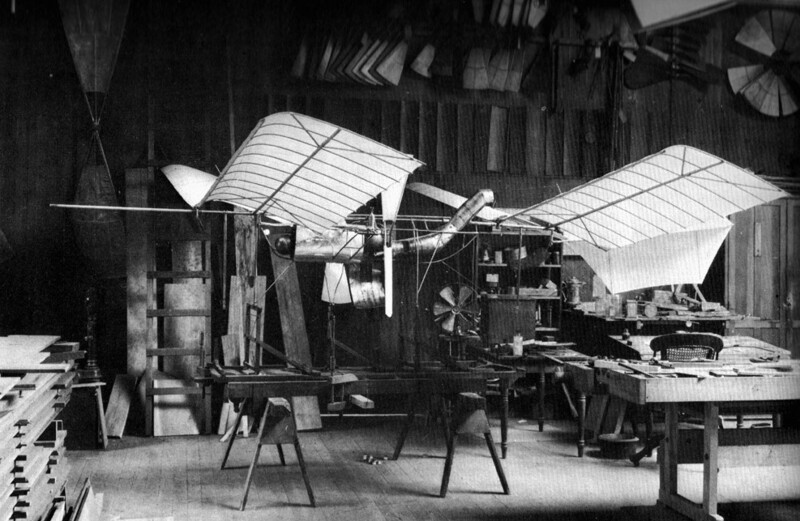 In 1895, Lilienthal began to build biplane gliders and was surprised and delighted with their stability. He also considered methods for balancing a glider other than weight shifting, outlining designs for gliders that could be steered by wing warping, moving the tail assembly, or using air brakes at the wing tips. He started to build a second powered aircraft, again with a carbolic acid motor. 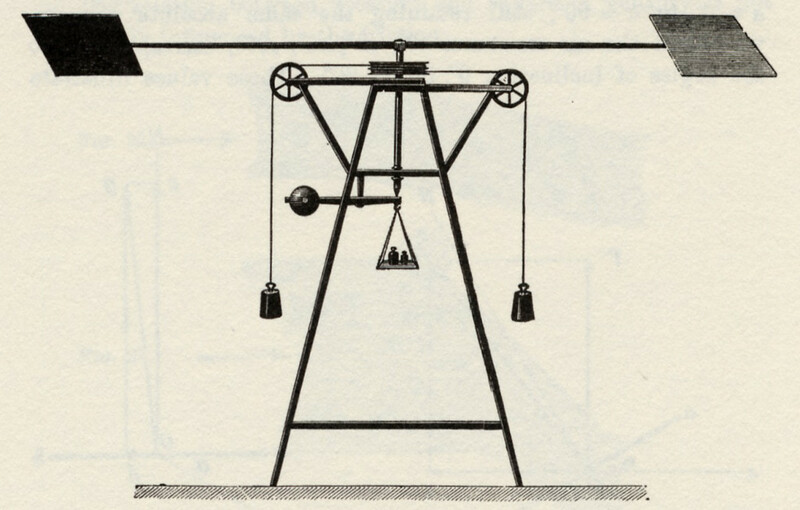 He had completed this machine but not yet tested it when he had a fatal accident in his No. 11. He stalled, the right wing dropped and he slipped sideways, striking the ground wing first. The rebound bow did not save him this time; he broke his spine in the fall and died the next day. His death astounded the world, but the 2000 flights he made before his death did much to convince the public that man could fly consistently and successfully. Lilienthal used this whirling arm mechanism to test the lift generated by his wing surfaces. Lilienthal Glider No. 16 had flappers on the ends of the wings to propel the glider, but these were never tested. 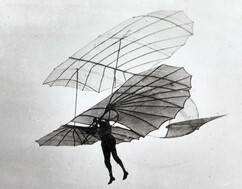 Lilienthal controlled his gliders by shifting body weight, bending his knees, waist, and swinging his legs. Glider No. 11, first built in late 1894, became Lilienthal's workhorse. 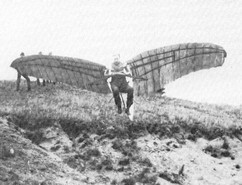 Lilienthal tested biplane versions of his gliders and found them remarkably stable but more difficult to navigate. 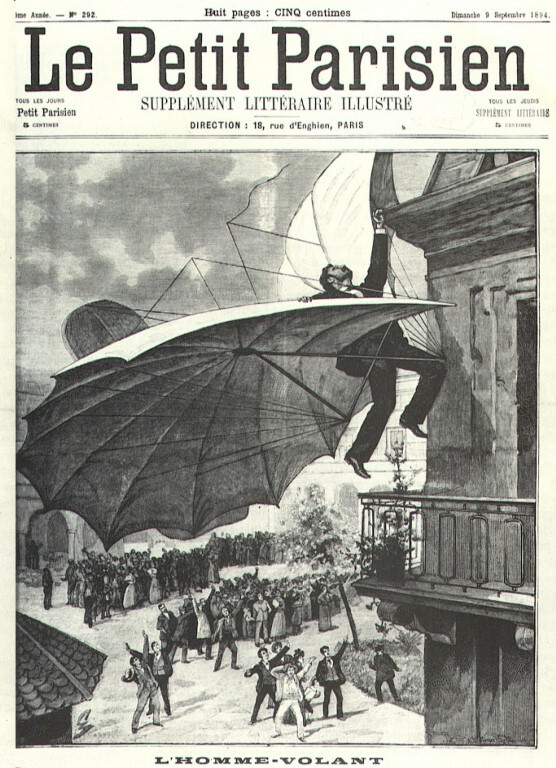 In 1869, Lilienthal tested an ornithopter suspend on a huge balance. 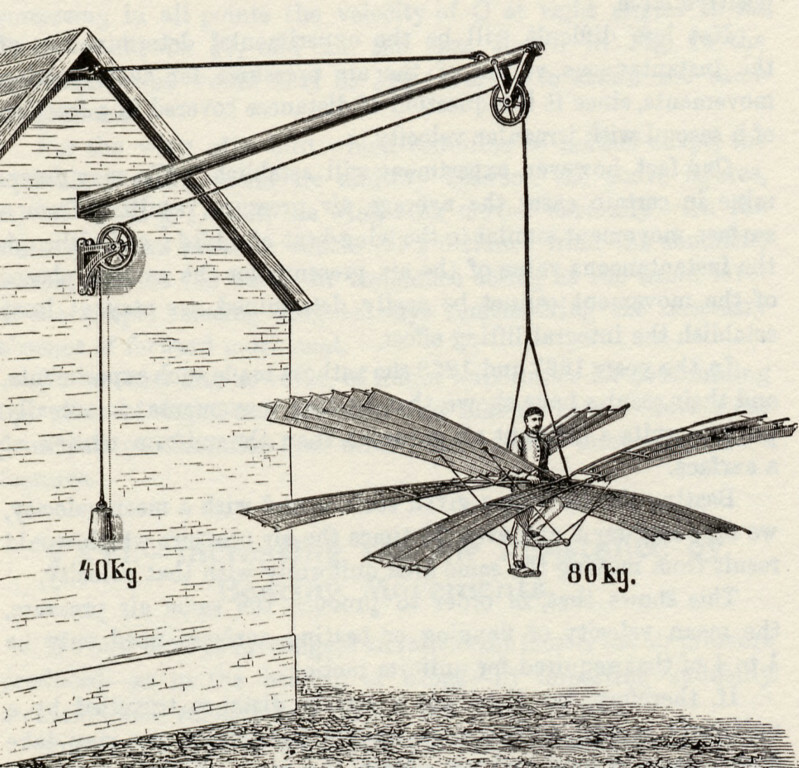 By adding counterweights until he could fly, he deduced how much lift he could generate. 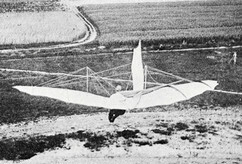 Lilienthal's first glider in 1891. 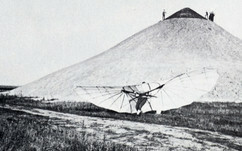 Lilienthal built the "Flugmonten" (Flight Mountain) to launch his gliders. The darker top is a hangar for his aircraft. Lilienthal Glider No. 9 had a "rebound bow" at the front of the airframe to absorb the shock of an impact. Lilienthal's flights earned him the same fame as a champion athlete. When the news wasn't enough, he was featured in pulp fiction stories. Lilienthal's glider after his fatal crash in 1896.